Cleanup and maintenance of your Mac are quite sensitive processes that require exceptional accuracy and reliability of the software. If you allow your cleaning application decide on your system and user data, you must be sure it’s treated wisely and carefully. And that’s exactly what CleanMyMac X does. Years of experience allowed us to create a reliable Safety Database that contains a long list of rules and exceptions for all cleanup occasions. It takes into account peculiarities of the current operating system and provides instructions on certain apps. The database is constantly extended with new items and rules to prevent cleaning mishaps and keep all your data intact. 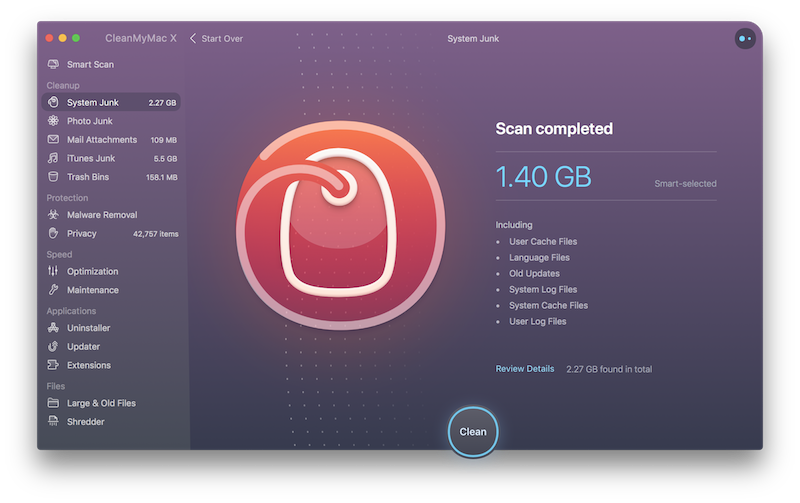 Smart Scan is a core tool of CleanMyMac X that incorporates 7 essential modules and starts the Cleanup, Protection, and Speed scanners. They use intelligent algorithms and Safety Database to filter out unneeded, outdated, and possibly dangerous items that you can safely remove. By default, CleanMyMac X offers to remove only automatically generated data related to system and app processes. None of your personal files is gone unless you want it. CleanMyMac X continues updating its Safety Database and gets smarter with every new version. However, there might be something it doesn’t know about your preferences. For example, you may want to ignore certain files or logs in cleaning modules, or you may need to hide some apps from the Updater module. CleanMyMac X allows you to create an ignore list for the following modules: System Junk, Photo Junk, Mail Attachments, iTunes Junk, Malware Removal, Updater, Large & Old Files, and Uninstaller. Switch to a module that supports the Ignore List functionality. Control-click an item you want to hide from the scan results and choose Add to Ignore List. To make your items visible in the scan results, open CleanMyMac X Preferences and remove corresponding items from the Ignore List tab. Starting from the X version, CleanMyMac has learned to detect and dispose of potentially harmful items like viruses, malware, spyware, and miners. Malware Removal is a stand-alone module that is also launched as part of Smart Scan to make sure your Mac is protected and healthy. It includes mostly open-source libraries, but we keep on updating it with new entries at least every two weeks. If you still have some questions regarding security and reliability of CleanMyMac X, please contact our Customer Support. We’ll do our best to provide you with the detailed explanations.